Each year, the MMMM concludes with the mega-meta reveal, a final puzzle that ties the year together. This year the mega-meta is a popular song from the ’70s. 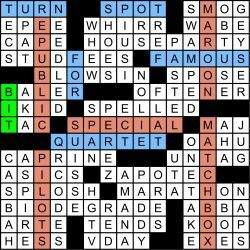 Each of the 12 puzzles contains a single triple-asterisked clue, and this final puzzle contains 12 triple-asterisked clues. 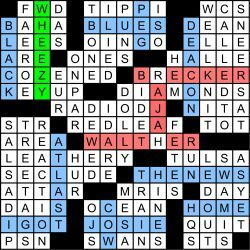 The central entry, RHYME, is clued as [What you need to find for each of the 12 entries with triple-starred clues in order to get a famous song lyric]. 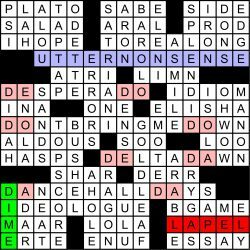 As shown in the table below, each of the 12 entries rhymes with one of the first 12 words of a famous song lyric: “It’s not time to make a change, just relax, take it easy.” The lyric is from Cat Stevens’s 1970 classic, Father and Son, this year’s mega-meta answer. 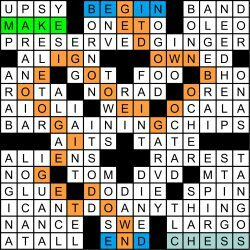 A total of 68 solvers cracked the mega-meta early this year, earning extra bonus points and the admiration of their peers. Five of them (LuckyGuest, thanman2, EBud27, LL, and Veep) got it in April, after just seeing “HITS ROT DIME SUE.” Pretty impressive! 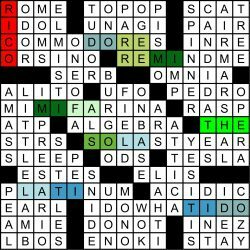 Another 96 solvers found their way to the solution after seeing the final puzzle, for a total of 164. The first meta of the year, “Brother, Can You Spare a Rhyme?,” hinted at the mega-meta gimmick, and that may have helped some get there. 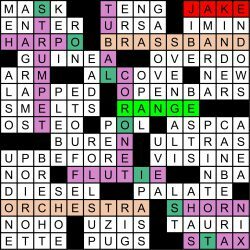 Because so many got the mega-meta early, I included a bonus challenge in this puzzle: Three words in the grid that do not have starred clues are related to the mega-meta. 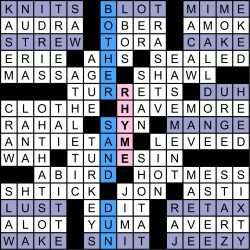 A total of 114 out of the 164 solvers found the three words which rhyme with “Father and Son”: BOTHER, SAND, DUN. I was able to record “Father and Son” in a studio a few weeks ago – the song has been particularly poignant for me this year. Thank you Ryan Nava for your great work on the video! I throw in at least one “red herring” each year to make the task of finding the mega-meta early just a bit harder. 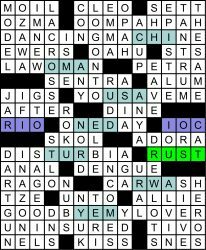 This year’s red herring was in the first seven puzzles, and consisted of clues like [DVR brand that rhymes with an ’80s rock band] for TIVO (referencing DEVO). Taking the first letter of each referenced band literally gives you a DEAD END, as you can see if you click the “+” sign. 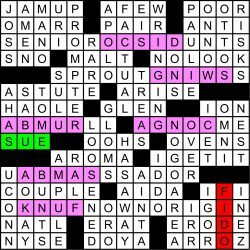 The first six puzzles this year all had one clue that used the word “father,” and the second six all had one clue with the word “son.” I’m not sure if anyone spotted this (and I’m pretty sure it wasn’t worth the effort! ), but you can click on the “+” sign below to see them. SEP CAIN Number one son? NonnieL So wonderful! 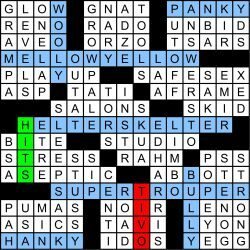 I have so enjoyed doing these puzzles this year! I have discovered some new music and re-discovered some old music. Looking forward to next year! AZJack Thanks for the puzzles. I enjoyed them, even though I have a tin ear and zero musical knowledge. Bob J With an easier mega this year, perhaps next year’s mega (if there is one) will up the difficulty level? It will (you can blame Bob if this makes you grumpy)! BarbaraK It was cool seeing Cat diagonally at 32! Cool (and unintentional)! RPardoe Hope the tip jar over-floweth! See you next year? Hmm…it is over-flowing – thank you all so much for the support. There will be a 2018 MMMM! Evan also suggests cluing HOT MESS = [2017 song by Girli that claps back at people who’ve criticized her songs and her appearance]. Cool video – had not seen it before. Thanks! Steve Blais From the legendary singer Flat Evens, of course. BrainBoggler RANKS PORE MALL DUH PUN! Howard B Thanks for another amazing year – you hit all the right notes. January: Brother, Can You Spare a Rhyme? July: Let’s Do it A Cappella! 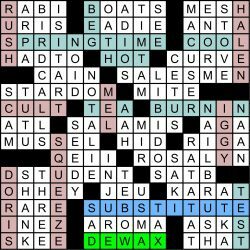 The average rating for the puzzle was 4.40 stars out of 5, the second-highest of the year, and the average difficulty rating was 2.81. This month’s randomly chosen winner of an MMMM coffee mug is Shawn Pichette from Cherry Hill, NJ. 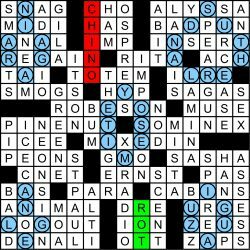 Thanks to Matt Gaffney for blogging the puzzle at Crossword Fiend, where you can rate the puzzle (thanks!) and/or leave a comment. The updated 2017 Leaderboard has been posted here. Please let me know if you think your score is not correct. A total of 127 people have qualified for the Grand Prize drawing by getting at least nine metas this year. Congratulations! The drawing will take place this coming week and the winner will be announced on January 9 (when you should receive the first puzzle of 2018). Thanks for all your kind words inspiring me to do this for another year, and for being part of the MMMM community!